Somewhere in the history of this project – probably here – I was a bit incredulous that It’s A Wonderful Life did not win Best Picture of 1946. After all, the movie was everything the Academy loves: it’s sappy, with charming acting, humor and grandstanding speeches, and a sense of nostalgia for a bygone time. Plus, with the Harry Bailey winning the Medal of Honor storyline, it also tapped into nationalistic fervor. In all, it seemed like a natural to win, except the Academy had other plans, giving the award to The Best Years of Our Lives, another William Wyler movie that I just don’t get. But as much as it seemed like the kind of movie the Academy would fall all over itself to honor, there were really two big reasons why it didn’t win – at least in my mind. The first, was The Best Years of Our Lives was an “important” picture about the war that just ended and the reintegration of our battle-scarred men back into society, so it had to win Best Picture. The other, and in my mind, the more damaging reason it didn’t win is because It’s A Wonderful Life pretty much already won best picture in 1938, only then it was called You Can’t Take it With You. You Can’t Take It With You is a simple story, really. It is about a pair of young lovers, Jean Arthur and Jimmy Stewart, who want to be married. But Stewart’s parents are greedy snobs, who don’t like Arthur’s family, who are all free-spirited kooks. To complicate matters, Stewart’s father is a big banker who needs to be Arthur’s family home to make way for some factory he wants to put up. Over a dinner at Arthur’s family home, hilarity ensues, and lessons are learned about the importance of money and family. In a lot of ways, You Can’t Take It With You feels like a dry run for It’s A Wonderful Life. After all, it shares a healthy amount of the cast. George Bailey’s here (Jimmy Stewart). So is Mr. Potter (Lionel Barrymore), George’s dad (Samuel Hinds), Mr. Gower (H.B. Warner), Bert the Cop (Ward Bond) and the rent collector (Charles Lane). Given how much of the cast was shared between the two films, it’s almost surprising Jean Arthur didn’t play the role of Mary Bailey. But more than just sharing many of the same cast, there is the same director (Frank Capra), the same screenwriter (Robert Riskin), the same cinematographer (Joseph Walker), the same music director (Dimitri Tiomkin), and many of the same themes, specifically that a man who has friends is the richest man of all. 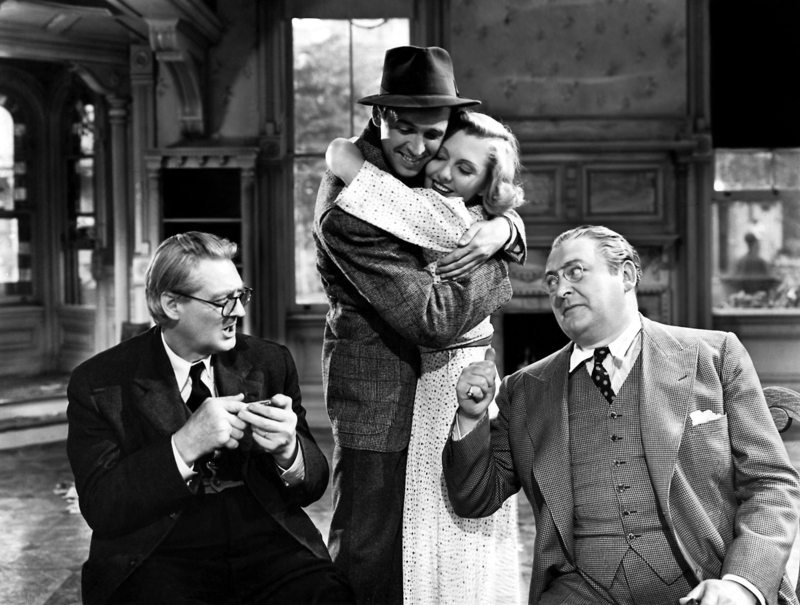 I should say that, though the film was disappointing, there was a perverse thrill in seeing Lionel Barrymore, mostly known as the crotchety, greedy Mr. Potter from It’s A Wonderful Life, play a character in You Can’t Take It With You who is otherwise diametrically opposed. In his courtroom scene in this film he has a great speech that essentially echoes the entire meaning of It’s A Wonderful Life: you can be rich, but you’ll still die alone. In the film, Jean Arthur’s sister Essie, is married to a man named Ed Carmichael, an Alabama college boy who just happened by the house one day. 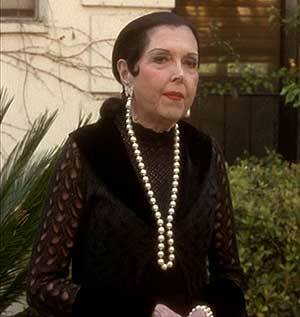 Essie is played by Ann Miller, star of many great films, the last being Mulholland Drive. I don’t know for sure, but I suspect this is probably the only time David Lynch and Frank Capra shared an actor. More interesting to me was the Ed Carmichael was played by Dub Taylor, one of those actors that when you see and hear him, you think you know him, but you can’t place the name. Though he was a big player in Sam Peckinpah’s movies, I most remember him playing C.W. Moss’s father in Bonnie and Clyde. Click here to see those already seen and to get a list of those left to see.